Indian Journal of research anvikshiki issn 0973-9777 bi-monthly international journal of all research, IJRA, online ISSN 0973-9777 Letter no v-34564,reg 533/2007-8) is a bi-monthly peer-reviewed, online, open-access (OA), journal supported by an editorial board consisting of 100 experts in all disciplines from 7 countries. The major task of IJRA (Indian Journal of research ANVIKSHIKI bimonthly international journal of all research ) is to rapidly report the most recent developments in the research by the academician and students. 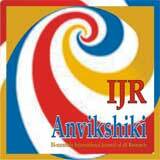 IJRA (Indian Journal of research ANVIKSHIKI bimonthly international journal of all research ) accepts papers on the following aspects related to arts, social, law, management, commerce, technology, science, medical promotion. We also encourage papers that cover all other areas of knowledge as well as basic research. Anvikshiki, The Indian Journal of Research is Published every two months (January, March, May, July, September and November) by MPASVO Press, Varanasi. U. P. India. Dr. Maneesha Shukla, Banaras Hindu University (BHU), Varanasi, India. Dr. Nagendra Narayan Mishra, Allahabad University, Allahabad, India.